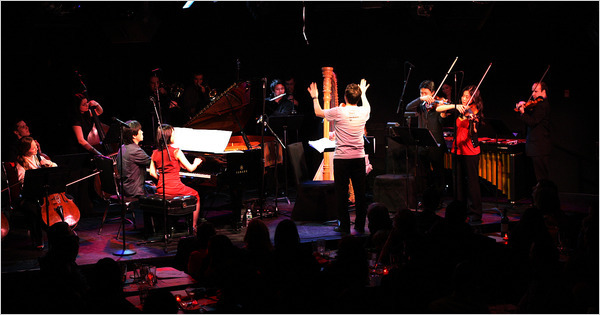 We feature the great Metropolis Ensemble with a full evening’s worth of incredible new music! First, our final MATA commission of the season, for the young New York composer, Ryan Carter; then Gaudeamus Prize winner Marko Nikodijevic’s extraordinary Music Box, followed by the brilliant twenty-year old Chilean Remmy Canedo’s Instantaneas 6; and topping it all off — a hip-hopera, The Oracle Hysterical by Brad Balliett and Elliot Cole! Metropolis Ensemble is a professional chamber orchestra based in New York City. Dedicated to emerging a new generation of composers and performers, Metropolis Ensemble has quickly established a reputation for presenting “new music played with the same kind of panache and bravura we usually experience only in performances of standard repertoire” (Esa-Pekka Salonen). Founded in 2006 by conductor Andrew Cyr, Metropolis Ensemble has commissioned and performed new music from the next generation of composers, including Timothy Andres, David Bruce, Jakub Ciupinski, Anna Clyne, Avner Dorman, Ryan Francis, Vivian Fung, Ryan Gallagher, Ray Lustig, Ricardo Romaneiro, Adam Schoenberg, Cristina Spinei, and Michael Ward-Bergeman, alongside imaginative and unorthodox masterpieces of the 20th Century and beyond that illustrate and embrace the fluid state of contemporary music from composers such as John Adams, Bela Bartok, Benjamin Britten, Aaron Copland, Osvaldo Golijov, Gyorgy Ligeti, Claudio Monteverdi, W.A. Mozart, Maurice Ravel, Esa-Pekka Salonen, Erik Satie, David Schiff, Dmitri Shostakovich, Igor Stravinsky, and Kurt Weill, illustrating and embracing the fluid state of contemporary music. Metropolis Ensemble recorded its debut studio album with the Grammy-winner Classical Producer of the Year (2005) David Frost, featuring the chamber orchestra concerti of composer Avner Dorman (b. 1975). The album was released internationally in January 2010 on the world’s leading classical label, NAXOS. Metropolis Ensemble received a nomination in the 53rd Annual Grammy Awards for Avi Avital (soloist) and Andrew Cyr (conductor) with Metropolis Ensemble for Avner Dorman’s Mandolin Concerto, part of the album. David Frost also received a Classical Producer of the Year Grammy nomination for his work on five albums, including his recording of Avner Dorman’s Concertos.